An endangered bird that lives in the Bay Area is not what scientists thought it was. The California clapper rail is a noisy, rare bird that looks a little like a small chicken and only lives in marshes around San Francisco Bay. But it's not, in fact, a clapper rail. It's a subspecies of something else. "The rails have been confusing people for a really long time," explains James Maley, the collections manager at the Moore Lab of Zoology at Occidental College. He says the rails in California have baffled scientists since they were first described, 140 years ago. The roots of the confusion go back to the East Coast, where there were two rail species: king rails and clapper rails. Then there were a bunch of different subspecies scattered around North and South America, including three here in California. One of those is the one we've been calling the California clapper rail. At first scientists thought the western birds were a subspecies of the king rails, then they decided the birds were clappers. "But nobody could figure it out," says Maley. 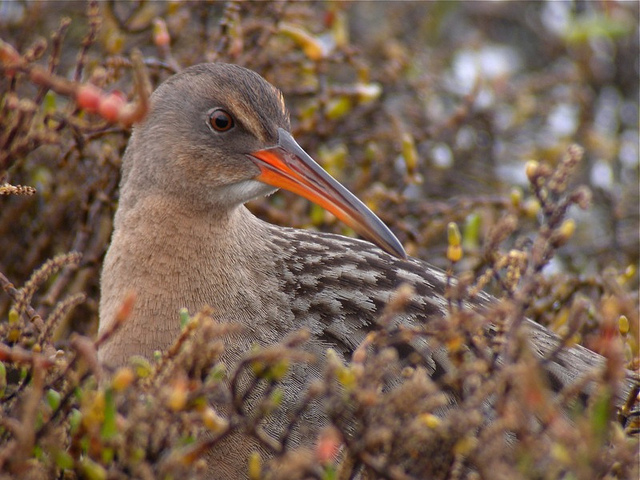 "I looked at the genetics and figured out the birds in California are actually neither king or clapper rails." Turns out, they're their own thing, which Maley named, "Ridgway's rail," after Robert Ridgway, the ornithologist who first described the birds. The newly-minted Ridgway's rail includes three subspecies: our local California Ridgway's rail; the light-footed Ridgway's rail in Los Angeles and San Diego; and the Yuma Ridgway's rail in Arizona, Nevada and eastern California. All three of them are endangered; changing their name does not change their status. It's part of a larger split Maley proposed. Two rail species will now be five: king rails in the eastern U.S. and the Caribbean; clapper rails in the eastern U.S. and Cuba; mangrove rails in South America; Aztec rails in the Mexican highlands; and the Ridgway's rails. This all became official when the American Ornithologists’ Union, which has the last word on North American bird species, released its "check-list supplement" at the end of July. Bird books will need an update, and serious birders will get to add another species to their lists if they've seen both East Coast clappers and what are now Ridgway's. Another thing that will have to change are all those informational brochures and signs at Bay Area parks. For instance, this pamphlet, from the East Bay Regional Park District. When I called to ask what they usually do about this kind of situation, Carol Johnson of the East Bay Parks was at a loss. "I can't remember the last time a species changed its name like that," she said. But she added, the parks reprint their pamphlets relatively regularly, and she'll just add the new name to the list of things to change. This sort of thing could come up again. Maley says changes like this, based on genetic research, are becoming more common. In a place as well-studied as California, the people discovering new species are wearing lab coats, not pith helmets. "There are a lot of species out there that we didn't know were species until we looked at their genes," he says.